Because it’s celebrating its centennial this month, I paid a visit to Sierra Madre and while savoring a cinnamon dolce latte at the local Starbucks, watched the sun set on a historic Union 76 ball. A perfect fusion of two projects. 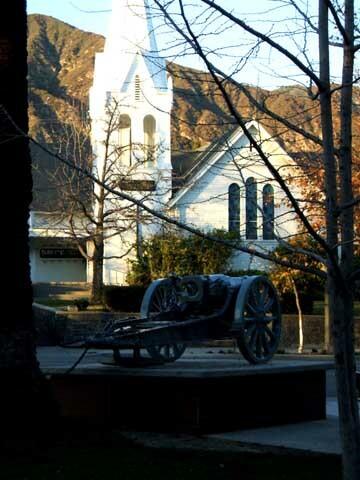 And here’s Sierra Madre’s Old North Church, with the artillery piece in the park across the street. Note the problem I encountered with lighting. Architectural photography is surely not my forte. Now for the business at hand. I’ve often thought that with a century of lawmaking under its belt, the state Legislature might want to take the afternoon off. After all, with more than a century of making laws, what’s left to regulate? · The Senate unanimously passes a ban on docking horses’ tails and prohibits anyone from bringing horses with docked tails into the state. Those who own horses with docked tails would have to register them with the local county officials. · The Senate passes a bill setting dairy standards and a bill to keep the polls open from 6 a.m. to 6 p.m.
· A committee urges the Senate to pass Sen. Black’s tax exemption bill for all the buildings at Stanford as well as the bonds the university holds in trust. · Sen. Wolfe introduces a bill making all robberies committed with a deadly weapon between sunset and sunrise punishable by death or life in prison. · Assemblyman Grove L. Johnson introduces a “no seat, no fare” bill providing that railroad passengers who cannot find a seat need not pay. The bill would include streetcars. · Assemblyman Johnson introduces a bill requiring firearms dealers to keep records of gun buyers’ names and addresses. 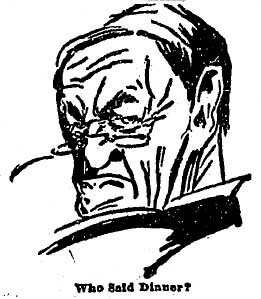 · The Assembly passes a bill by the late Assemblyman Burke making it illegal to spit on sidewalks or in trains, cars and other public conveyances. · Sen. Sanford introduces a bill seeking to restrict corporate donations to political campaigns. I’m so glad the Senate wrapped that up 100 years ago so it can get on to more pressing matters.